John Christoforou is an important pioneer of the Nouvelle Figuration movement which emerged in the 1960’s. Christoforou’s “figuration”, however, is not merely deconstructualised portraiture, it is the consequence of something profoundly more complex. The strange anthropomorphic forms that dominate the canvases are conjured up from an inner cosmos and have been referred to as messianic visions. These extraordinarily powerful compositions are manifestations of the unleashed forces of man’s nature, expressed with a passionate inventiveness and concentrated intensity. Christoforou spoke of the purpose of his work as “a new force with which to fight against the ever diminishing freedom of inner life”, a testament to the sensation of primal humanity which is being increasingly marginalised and lost in isolation. These paintings are born of and inextricably linked to that vital element of our self’s. 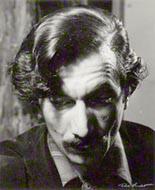 Christoforou attended the School of Fine Arts in Athens, 1935-1938, after which he spent several years in London before moving permanently to Paris. During the Second World War he enlisted and was despatched to India for two years. His experiences from this period were to greatly influence his vision of humanity and his personal philosophy, which would later fuel his artistic creativity. Christoforou became increasingly involved with the Parisian avant-garde where he found affiliations with highly expressive artists such as Lindstrom, Corneille, and Appel, who were producing similarly challenging works with provocative humanistic content. Over the next few years Christoforou would hold several high profile exhibitions in prestigious art establishments including the Institute of Contemporary Art, 1956; the Whitechapel, 1958, 1961; the Tate Gallery, 1958; Maison Internationale de la Cité Universitaire, 1958; Musée d’Art Moderne de la Ville, 1962,1967; Musée d’art Moderne, 1962; Une Nouvelle Figuration, Galerie Mathias Fels, 1962; Ecole de Paris, Galerie Charpentier, 1963. Christoforou’s work is represented in numerous major public collections, including Fonds National d’Arts Contemporain, Paris; Contemporary Arts Society, London; Museum des 20 Jahunderts, Wien; Museum of Modern Art, Taiwan; National Museum of Contemporary Art, S.Korea; Musée de Cuautemoc, Mexico.